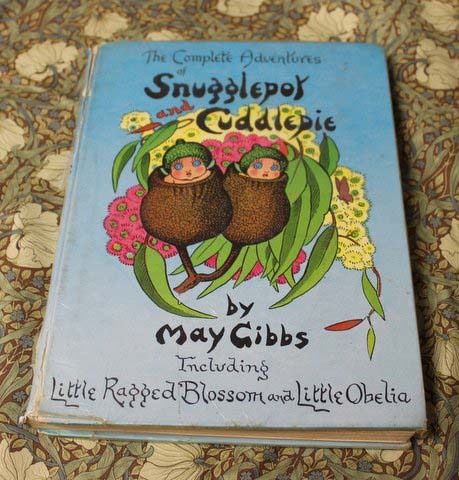 written by May Gibbs, a famous Australian author. I decided to do an I SPY baby quilt for my first grand baby. No one is pregnant yet so i am taking my own sweet time collecting fabrics and adding pieces little by little. The hexy section shown here is made from parts of the Funky Monkey line. the middle yellow monkey is me, the blue one is Gary. The hexies 1-5 represent each of the kids. My daughter-in-law is the green hexy wearing the pink dress with a strand of pearls. (very top of pic) Her hexagon is connected to the number 1 since she is married to my oldest. My second son does give her a lot of grief so I thought it fitting to put her above #2 so she can keep an eye on him. The templates are called “Holy Peepers.” Isn’t that a great name? The templates are the brainchild of Kim and Dave Bradley. Kimpossible and QuiltJane both sell all sizes of these templates if you are interested..
area to trace my sewing lines. Once I get a few more pieces added I will be working in my treasure from Australia. Thank you Jane for getting me hooked on another hexagon project. We will make you an honorary hexaculturalist yet, Lissa! I love all the prints in the quilt. Que preciosidad de trabajos son muy bonitos. Tienes un blog que es un encanto. ca-Ute! This quilt ought to keep the recipient busy for HOURS! Thank you for the giveaway- who couldn't use a new inspiration book, right? Siempre he cosido los hexagono a mano y ya va siendo hora de hacerlo a máquina.Gracias por el tutorial,las telas son preciosas! Cool tool. I may have to check that out. I made my grands their own quilts but I made an I Spy quilt to have at my house! It has been one of their most favorite things since! Even now that they are older, they still love to get it out and play I Spy! Your "future grand" will be very lucky to receive their own I Spy quilt!